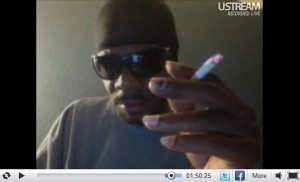 The Coathanga Strangla, Brotha Lynch Hung, went to UStream to do a live broadcast last night. Brotha Lynch Hung talked to fans about his latest album release, Coathanga Strangla. The live broadcast lasted for two hours and attracted as many as 400 live viewers at one point. Lynch covered several topics including the making of the new album, his “Spit It Out” video premiering on MTV and confirmed his guest spot on Tech N9ne’s upcoming All 6’s And 7’s release. Brotha Lynch Hung mentioned that he has a tradition to wait to listen to his album in it’s entirety until the day of the release. He said he wants to hear the entire album when he knows all the fans are also able to listen to the album. You can download the Coathanga Strangla on iTunes. Check out the entire UStream broadcast below.